Arsonists are believed to have attacked the family home of the 7 July London suicide bomber Germaine Lindsay in the early hours of Friday morning. Police were called to the unoccupied house in Northern Road, Aylesbury, Bucks, at 0630 BST after report of a strong smell of petrol in the street. Houses in the immediate area have been evacuated while police and fire services examine the situation. Police said the incident is being treated as an attempted arson attack. Police are appealing to anyone who was in the area on Thursday night or in the early hours of Friday morning to contact them. 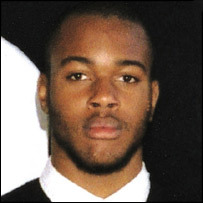 Lindsay, 19, died in 7 July bomb attack on the Piccadilly Line London Underground train, which killed 26 people. Last week, officers of the Metropolitan police and Thames Valley Police began a search of the semi-detached house on Northern Road, which Lindsay had shared with his wife, Samantha Lewthwaite. Ms Lewthwaite, who is not currently at the house, last week condemned her husband's attack as "horrific". Supt Carole Haveron said: "The substance was found around the family home of the fourth London bomber which is currently unoccupied. 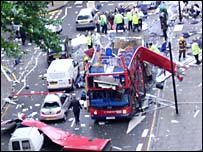 "To conduct a premeditated attack like this is in itself a crime that puts the lives of innocent people in Northern Road at risk who themselves are united against the atrocities that took place in London. "We would urge anyone who may have information about the person or people who carried out this act to contact us as soon as possible."